King Kong Escapes (1967) – SKREEONK! Today is a good day. I’ve just seen King Kong Escapes for the first time – And I loved it. Original Theatrical Poster for King Kong Escapes, released in 1967 as キングコングの逆襲 Kingu Kongu no Gyakushū by the wonderful folks at TOHO Co.
King Kong Escapes is a better – no, MUCH Better film than King Kong vs Godzilla. Well, the american version anyway. ‘KKE’ is a wonderful romp of a Toho classic – featuring a classic Akira Ifukube score, Eiji Tsuburaya’s special effects at their utmost, and Linda Miller! Who the hell is Linda Miller, you ask!? That delicious little blondie in the middle there is Lt. Susan Watson, one of our main heroes played by the ever-so-beautiful Linda Miller. She can be slightly irritating while screaming at Kong like he’s a mentally handicapped chimp (I’ll get to that later) – But I’ll be damned if she isn’t the most attractive thing to ever grace Toho’s moive sets! However, if you’re a Godzilla fan, you should recognize Mr. Jiro there right off the bat. That super studly japanese native is Akira Takarada, who plays the ever heroic Lt. Commander Jiro Nomura. Last – but certainly not least – is the Clint Eastwood’esque Rhodes Reason, who leads the cast (and the entire flick) with more sweat-fueled macho ballseyness than Chuck Norris himself could muster! The story begins with two separate ventures. Commander Nelson and his crew are patroling the pacific in their submarine while the evil Dr. Who (played with gusto by the wonderful Eisei Amamoto) and his gigantic robot, Mechani-Kong are digging up a mysterious and ultra-rare element known as Element-X. Dr. Who is working for the illustrious Madame Piranha (the classic beauty Mie Hama) who has enlisted the help of the mad scientist and his crew to use Mechani-Kong in unearthing Element-X at the North Pole. Their plan fails as soon as Mechani-Kong reaches the highly irradiated substance- its magnetic waves frying the controls of the giant robot. The evil Dr. Who immediately commands his crew to “work day and night” to rebuild the robot and try once more. Early on in the project, Madame Piranha is loosing faith – and prepares to withdraw her funding. If the operation is a success, she plans to buy all of the deadly Element-X for her (fictional) country, and use it to rule the world through fear. Meanwhile, Carl Nelson, Jiro, and Susan’s submarine is thrown off course – forcing it to dock for repairs near Mondo Island. This excites our main heroes, as they’ve been discussing the island’s legend of King Kong for some time. They land – and of course the beautiful blonde Lt. Susan Watson is right up Kong’s alley. He quickly awakens to her screams and comes to her rescue – saving her from the salivating Gorosaurus. 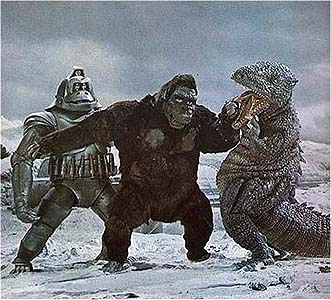 Kong and the giant carnivore battle it out in the film’s first in a line of satisfying kaiju battles. The mighty ape saves the girl, and after another tussle involving a Giant Sea Serpant – Kong reluctantly returns Susan to the submarine. This establishes their connection which will come into play later. The rest of the story revolves around Dr.Who’s quest for Element-X and his lust for money and power. He knows of the real Kong – and after his mechanical double fails again – he decides to kidnap the real Ape King and use him instead. Pummeling Kong’s home of Mondo Island with Ether bombs – the kniving Kr. Who succeeds and transports the monster to his base at the arctic pole. The evil scientist then plants an intercom device and a brain wave communicator on the unconscious Kong – hypnotizing the mammoth ape to do his dirty work. Kong indeed unearths Element-X deep within the ice and soils of the arctic – but the massive amounts of radiation once again foil Dr. Who’s high-tech devices. King Kong escapes (imagine that) and makes his way back to the underground base where his friends Susan, Jiro, and the mighty Commander Nelson are being held hostage. The evil Doctor plans to use the heroic trio as a last resort to manipulate the monster. Madame Piranha meets with Commander Nelson – and in classic James Bond style, Nelson swoons the beautiful diplomat into seeing things his way. Piranha helps our heroes escape several situations after she falls for the Commander. Its also interesting to note that through all of this – we find out that Nelson was the developer of the Mechani-Kong robot. He and Doctor Who were old coleagues – and the manipulative Dr. Who ended up stealing the plans to develop them himself! King Kong escapes (appropriately named movie, eh?) again and ends up in Tokyo for our film’s climax. The ever so wonderful Lt. Jiro stops the armed forces from opening fire on the confused Kong. Moments later we are treated to an excellent final battle between Kong and an invading Mechani-Kong atop Tokyo Tower. Susan gets mixed up in the titanic struggle – only to be saved by Jiro and a handful of soldiers. In the end King Kong swings victorious over the mangled and dismembered body of his robotic twin down below. But its not over yet! Dr. Who and his crew (hah!) of evil miscrients attempt to escape Tokyo on their battle cruiser. Susan commands Kong to take out the ship (yelling at him again in an incredibly irritating manner) and Kong does just that. He beats the cruiser until it sinks – where we are treated to a great sequence of effects shots – and Dr. Who goes out like a champ… down with his ship. King Kong Escapes ends the exact same way as King Kong vs Godzilla, with Kong swimming out to sea to fight another day. The difference is, however, that King Kong Escapes is the Kong movie that Tomoyuki Tanaka wanted to make (see the upcoming King Kong vs Godzilla review for more on that interesting subject). Now onto why that’s so! Toho effects legend Eiji Tsuburaya really outdid himself with this 1967 entry into his long line of kaiju credits. ‘KKE’ features some of the best effects of any showa era Toho film that I’ve ever seen, and its not even a Godzilla movie! Perhaps its because I watched King Kong vs Godzilla literally minutes before I watched ‘KKE’ – but almost every effect in this film is pulled of stunningly. The miniatures areabsolutely fantastic. The set of Tokyo was superb – spot on. They even went as far as to green screen (or blue screen in Toho tradition) Linda Miller running down the streets of a miniature set instead of the actual streets – just to give the final battle sequence a conjoined feel. There are two things that stand out in my mind as uber-impressive for a 60’s sci-fi film. The first is the hovercraft that transports our heroes from their sub to Mondo Island and back. The hovercraft itself is well designed and all – cute and colorful – but the way its movement and effects were executed sold it completely. As the vehicle hovers over the ocean, the water churns beneath it – and not a wire is seen along the hovercrafts perfectly smooth trek. The whole schtick is made even more believable when we see the full size replica that our crew rides in. The full sized vehicle creates the same air waves that force the foliage surrounding it to toss and turn as it rotates 180 degrees to transport its passengers back to the submarine. The miniature even holds its own believability during Kong’s fight with the Sea Serpent. The most impressive effects work of the film, though, appropriately comes with the final battle of the movie. The miniatures and ‘bigatures’ of the Tokyo Tower are spectacular – even holding their ‘reality’ when the two Kong’s are ripping it apart. I dont want to ruin too much – but the last twenty minutes of this film make the entire experience worth it. Eiji Tsuburaya really outdid himself here… all of the chroma key effects (green/blue screen) throughout were a massive improvement over previous Toho films. The music in this movie stays mostly intact for the american release. Here we can hear all the trademarks of a Akira Ifukube score in his signature style. You can hear much of the influence for his future films in ‘KKE’ – most notably in the form of the title theme. 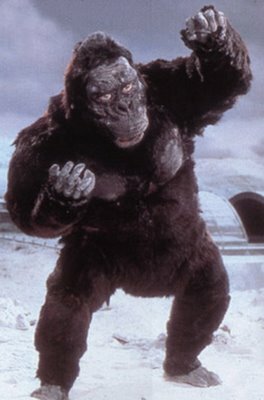 King Kong Escapes’ main theme would later be modified by Ifukube for an excellent kaiju classic with similar elements to this film – Godzilla vs Mechagodzilla. Other than that, Ifukube gives us another solid composition. The music fits every moment of scenery – and never once overpowers the action or dialogue. I spoke a bit about the main actors in the beginning, and there’s really not much else to say about them once you acknowledge the fact that they all turn in solid performances. Akira Takarada as Jiro and Eisei Amamoto as Dr. Who turn in the best acting of the flic, but both Rhodes Reason and Linda Miller are so charismatic you tend to overlook their lesser-developed characters. As I mentioned early on – I’m crazy for Mrs. Linda Miller – I think she’s absolutely gorgeous and incredibly charming. Just what the doctor ordered for such a film! But her character of Lt. Susan Watson can be a bit… nerving. The way she yells and communicates with/at Kong is neither believable or cute. I hate knocking on believablility in Kaiju films – but she literally yells at Kong like she’s trying to breach a slow toddler. Other than that, she’s goldenly dreamy. Oh, and if you didnt know – the movie’s other beauty, Mia Hamma – is a BOND GIRL! Stick that in your pipe and smoke it. Rhodes Reason as Commander Carl Nelson is classic. And I mean that. The guy is a straight up Clint Eastwood/Sean Connery type who forces you to remember his performance whether you liked it or not. He had fun with the role – and glossed every one of his scenes over with debonair charm and just the right amount of sternness. Reason and Takarada as Nelson and Jiro have an excellent chemistry, even through acting in two separate languages. As much as I’ve said about Reason, I actually left the experience with Takarada as my favorite – he’s just a classic Toho actor. Speaking of Toho classics – Dr. Who’s main henchman (listed as Chief) is portrayed by none other than the hilarious Yoshifumi Tajima, or Kumayama from Mothra vs Godzilla (1964)! Yet the ONE blinding weakness of the entire film is sadly its title kaiju – King Kong. The suit is again horrible. Actually, multiple suits were interchanged throughout scenes (sometimes noticeable) and even a puppet was used – But they’re all horrible! Kong looks quite different than he did in his previous Toho outing – but the change is no better. He’s still the ugliest damned thing they’ve come up with – maybe Lt. Susan was yelling at Kong like that for a reason. I will give them one thing, though… The eyes/eyelid combo did help tremendously with conveying Kong’s current status’ and emotions. Other than his horrid appearance, Kong really is used effectively in the film and has a surprising amount of character. The other suits garner much less screen time – but are impressive none the less. Gorosaurus looks great (especially his famous kangaroo kicking – why couldn’t they have done this in King Kong vs Godzilla instead of that crappy stop motion sequence) but is in the movie for a surprisingly short amount of time. I’m not a fan of super-goofy Mechani-Kong design at all – but the suit itself allowed for an excellent range of motion and held up nicely. All in all, King Kong Escapes is and was a success for Toho. I wanted this two dvd set solely for King Kong vs Godzilla… and I had absolutely no idea that I would end up enjoying this film more than it’s predecessor. The quality of the Universal release is fantastic – and far beyond the print of KKvsG that was released with it – very vibrant and colorful. Major kudos go out to Akira Ifukube (as always) for a solid score, Eiji Tsuburaya for some of his best effects work ever, and the four main actors for memorable performances. ….Dont think I’m going to let this insanely long review end without mentioning Ishiro Honda. The man’s Ishiro Honda, for christ’s sake! Honda directed this film quite well – and if the american version is any reflection of his original – the timing and cosmetic choices represent his lighter style at its best. King Kong Escapes is easily a 3.5 out of 5! Kid-friendly, and if you want something realistic and serious then run! Heavily due to the success of King Kong vs Godzilla, Toho wanted to keep Kong around. The first project was Continuation: King Kong vs Godzilla, a direct sequel to the 1962 cash cow that adjusted for inflation was easily the highest grossing Godzilla film of all time. That project never came to fruition, but Toho later collaborated with Rankin/Bass in hopes of making a small series of Kong films. The first project was discarded by Rankin/Brass but didn’t die out completely; Toho simply swapped out King Kong and replaced his role with Godzilla, which was released as 1966’s Godzilla vs The Sea Monster. The script that actually did succeed was this one, King Kong Escapes. With that bit of history out of the way, this movie is really aimed at a younger audience, so if you want something more serious, I’d kindly recommend you look elsewhere. The plot is totally ludicrous, with an evil mad scientist (that apparently is filthy rich) who wants to mine “Element X”. 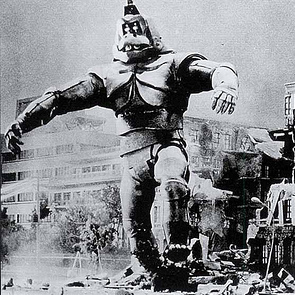 Naturally, you’d build an enormous 35 meter mech named Mechani-Kong, right? It’s interesting that when you mention a giant Japanese robot monster you’d be inclined to think of Mechagodzilla, who amongst giant mechs is far more popular than anything the world over. And yet, this here Mechani-Kong was in a movie nearly a decade earlier. Speaking of monsters, we should probably start with King Kong. He looks terrible, almost like a joke. Will kids mind? Probably not. Mechani-Kong actually doesn’t look bad. The giant snake would’ve been fun to have had his brief encounter with King Kong extended a bit, and I wonder if the 1976 King Kong remake was inspired by the snake used here rather than the dinosaur of the 1933 original. This film just seems to have given birth to a number of things, whether it actually did or not. We can’t forget about Gorosaurus. He looks pretty good, and his kangaroo kick was fun stuff. Corny as heck, but fun. This is also actually the first film for Gorosaurus at Toho, although he’s better known for his role in the much more popular Godzilla franchise, most notable being 1969’s Destroy All Monsters. This is a fun movie, something you could buy for your kids or just enjoy on your own as long as you understand its intentions. The monster action is overall quite good and the picture holds your attention throughout the film. I bought the DVD and enjoy it. I can’t give it above average marks for a number of listed reasons above (did I mention King Kong seems to understand English/Japanese as long as the female lead speaks slowly and loudly enough? ), but I still recommend it if it sounds like something you could appreciate, quirks and all. Posted on August 31, 2011 4 By Jon D. B.	Kaiju Movie Reviews! Posted in Kaiju Movie Reviews!, Toho Movie Reviews! Pingback: Via August Ragone – Universal to Release Toho Kong Films on Blu Ray! | SKREEONK! Yes, Linda Miller is delicious in King Kong Escapes. Especially when Kong puts her down on Mondo Island, causing her to fall, revealing the top of her stockings and garter belt. Also check out the scene when Commander Nelson opens Dr. Whos’ desk draw. Inside we find a corncob pipe. He wears a black cape, smokes from a corncob pipe and craves element-x. Awesome. I also love Mie Hamas (Madame X) death scene. With each shot fired by Dr. Who, she thrashes her head side to side, moaning deeply. Scared me as a kid. She definitely owns that death scene. Never saw anything like it since. Bravo. Pingback: FULL REVIEW: KONG Is At His Most Brutal and Beautiful in SKULL ISLAND – SKREEONK! Pingback: REST IN PEACE NAKAJIMA-SAN: The “Soul of Godzilla”, Haruo Nakajima, has passed at age 88 – SKREEONK!